The church area seats around 80 with chairs which can be flexibly arranged. The floor is carpeted. There is a state of the art audio visual system including a microphone with hearing loop. 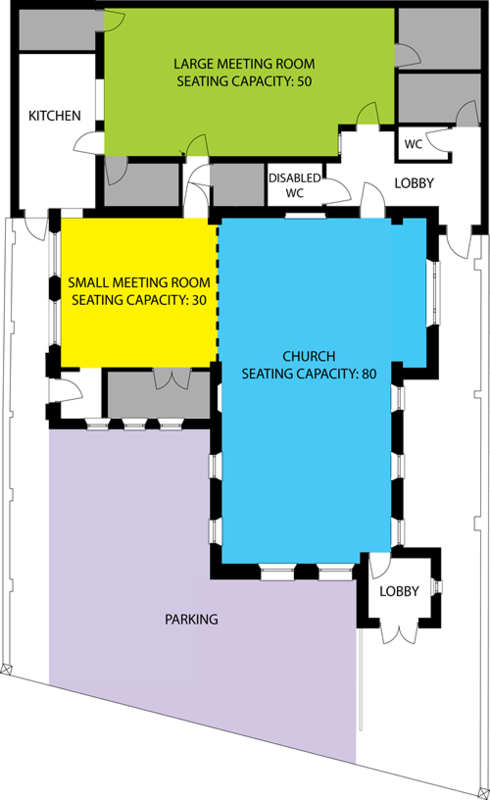 The small meeting room can seat 30 people and can also combine with the church area to make a larger L-shaped room. The large meeting room at the back of the building seats around 50 and has a hard floor surface. There is a self-contained audio-visual system, including a microphone and hearing loop. The audio-visual system in the church can also be relayed to this room. Tables are available and the kitchen (with hatches to both meeting rooms) can cater for a buffet for up to 100 people. There is parking on-site for around 6 cars and on-street parking is available nearby.